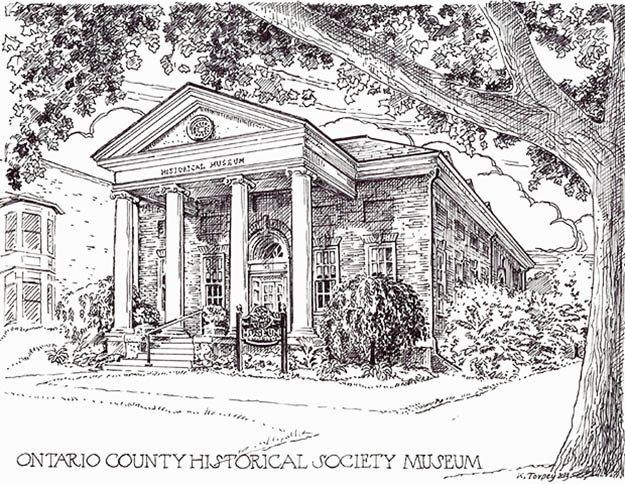 The Ontario County Historical Museum, a Georgian Revival building, is a landmark on Main Street Canandaigua. It was designed by famed architect, Claude Bragdon and constructed in 1914 with donated dollars from the Canandaigua community. It houses the antiquity of our community and is the location where we present Education Programs and exhibitions of our collections. It also is the location of our Research Library. When it was first built the building also housed the Wood Library, Canandaigua’s Public Library. In 1972 the Library outgrew its space and relocated to the Sibley House at 127 North Main Street. As historic partners the library and the Historical Society continue to collaborate on programming. The Historical Museum holds the Society’s archives, rare documents collections and research library. It has three exhibit galleries and a book shop where local history books can be purchased. The Education Room in the lower level is the venue for educational programs that are held monthly during the Winter, Spring, and Fall.